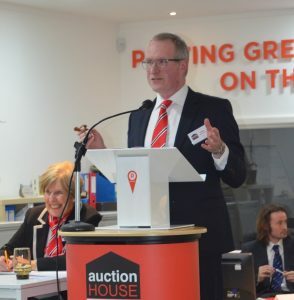 Auction House Readings held their first property auction of 2017 on the 23rd February to coincide with storm Doris. A great catalogue of local properties promised to fill the room with eager bidders. Record numbers of pre-auction enquiries had been received and all at Readings anticipated a great turn out. As Doris whipped up a storm outside, the auction room remained somewhat quiet. Having received calls from would-be purchasers suggesting that they were struggling to get into the city due to road closures. Taking the bull by the horns the auctioneer left the sales room in search of further clarification. The local police had closed St George’s Way and told us that it was due to unstable local buildings being a threat to human life and that the road would be closed until well past 7pm. On our return to the auction room and the prompt 6pm start looming, the numbers were still limited and an announcement to the room was made suggesting that the property auction would be delayed with a further update at 6.15pm. At which point the numbers had swelled to around 40 buyers. Some of which had parked their cars some distance from Granby Street and had run to ensure their arrival. By 6.30pm the sale started with upwards of 80 buyers having braved storm Doris to attend. Testament to the lots on offer and the ingenuity of our buyers! An extremely lively sale ensued with an 83% sales success with notable figures being achieved on a terraced house in Belgrave selling for 138% of reserve and a handsome semi-detached house in Western Park achieving 130% of the guide price. Our next sale is due 4th May 2017 when we all hope for fairer weather and no road closures. If you are thinking of selling at auction please give James Court a call on 0116 204 6162.